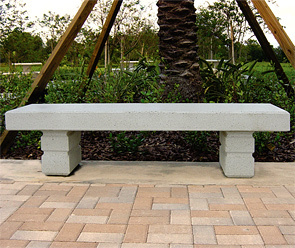 The La Com style concrete bench offers solid performance along with its unique structural design. The La Com Bench comes in a variety of colors and finishes to match most settings. This concrete bench is durable and built to last. It is reinforced with a 3/8" steel rebar for added durability and has leveling feet to adapt to uneven surfaces. The 20" height offers comfort to most individuals and can be slightly adjusted with the leveling feet. Choose from smooth stained acid wash finish, weatherstone concrete, or customize with the available ground glass concrete custom options. Just select your desired finish type, matrix color and finally choose the recycled glass color to best suit your needs. Do not place this park bench on grass or any surface that will flex or move. It must be placed on a flat surface such as concrete.